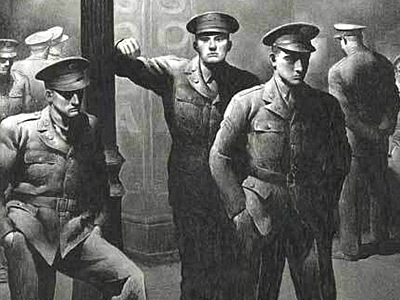 Riggs's dark art specialized in muscular, imposing men in homosocial environments. When he was young, he ran away from home and joined the circus. His interest in the grotesque and in circus scenes certainly makes sense, but he was also fascinated with the all-male worlds of the boxing ring and the military. Medical wards and asylums were also regular subject matter in his fine art lithographs. His artwork didn't have the homey details of a Norman Rockwell illustration; in fact it was quite stripped down to essential elements. His massive, brutal male figures could hardly compare with J.C. Leyendecker's sensuously beautiful and heroic young men either. But looking at Riggs's work triggers a recognition of sorts — an appreciation for the beauty and raw power of the male form. 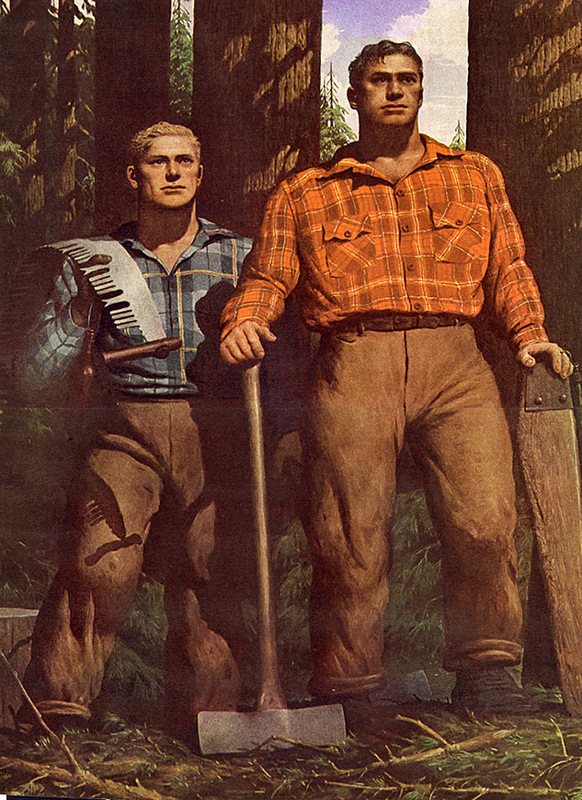 He seems to have been influenced by some of the other more openly gay illustrator-artists of the day: Jared French, George Tooker, and the most overt influence, Paul Cadmus. 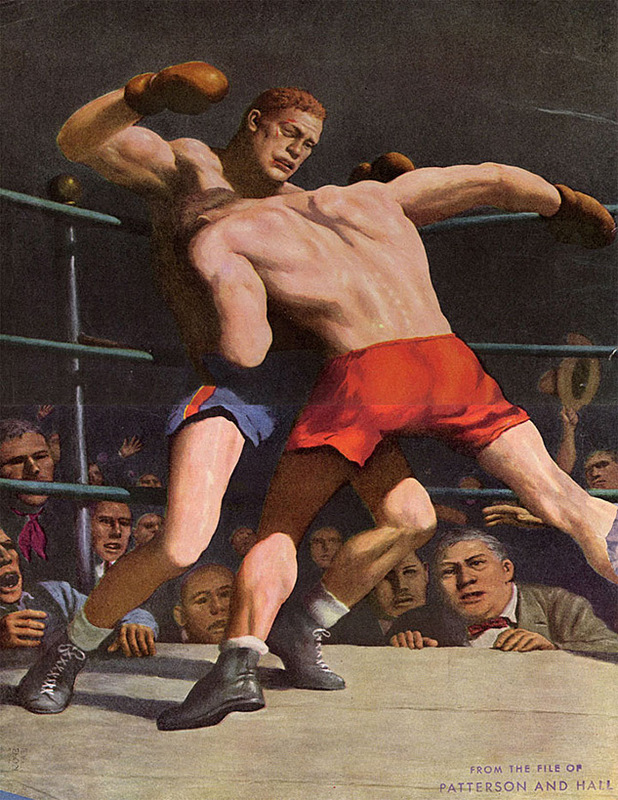 His painting The Brown Bomber shows the boxing victory of Joe Louis over Max Schmeling. 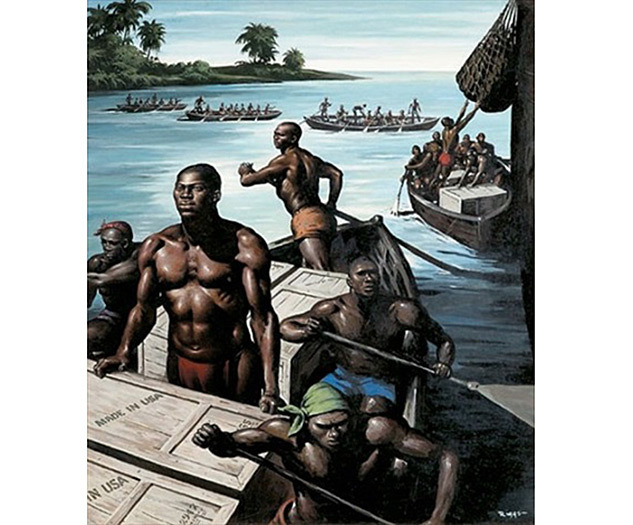 This is one of the paintings that earned Riggs election to the National Academy of Design in 1946. In his biographical information there is no evidence he was gay. There is also no evidence that he was married or had a family. But he was an artist passionate about the muscular male form and of homosocial environments, rendering both the forms and the scenes in mythic proportions. There is a grimness to his work, like an underlying threat. Some of the work collected here was produced during the Depression. These grainy, shadowy lithographs were a common style of the period, but Riggs's work has a tension that verges on frightening, like the electric moment right before violence errupts.